It’s a ten-oil blend including Kukui Oil for an intensive hit of Omegas 3 and 6, Sea Buckthorn Oil for the antioxidant fix and Argan Oil to heal and replenish the skin. Contains plant Squalene to help lock in moisture and help to prevent water loss. Contains powerful anti-inflammatories to help protect skin from the ageing effects of irritation. In other words, this oil is a supercharged powerhouse of plant actives, vitamins and nutrients, all working together to keep the skin protected, hydrated and de-stressed. The de-stress part is very important, I think, and this is one of the things that I think Pai do best; it’s all very well bunging on active-this and active-that, but if it’s aggravating your skin then you’re actually doing more harm than good. If you’ve the type of skin that flares up at just about everything then it’s difficult to find products that are both calming and effective, but I think that Pai offer some really great solutions. Their eye cream is one of the only products that I can use on my undereye area when I’ve been on a beauty shoot – it instantly soothes the skin and just feels very pure and natural. The Age Confidence oil obviously has quite a different feel – it’s an oil for a start! – but the same comforting, nourishing effect. I’ve been using it as a kind of “overnight superbooster” every few days because my skin has been a little temperamental in this strange, in-between weather. Because my skin isn’t particularly dry, this isn’t an oil that I would use nightly, but if you have any dryness at all then you absolutely could. And probably should! You can either use the Age Confidence Oil on its own or follow it with your regular moisturiser, depending on how dry your skin feels – you could even mix a few drops in with your moisturiser if you wanted to. I prefer to use the oil alone as a bedtime treatment, pressing it into my skin with the palms of my hands. I don’t follow with another moisturiser because my skin is combination and too much oil can send it into a frenzy, so I just pat-pat-pat and add a few more drops if I need to. Usually three drops will be plenty. I know that many of you are already diehard fans of the Rosehip BioRegenerate Oil; that one is perfect for if you want to help repair and rejuvenate the skin. It’s a hard-working oil that helps to promote regeneration so that skin damage is repaired and it’s a great little bathroom cabinet beauty staple. If, however, you are looking for a nourishing beauty oil that’s more luxurious and nurturing then this is the one to plump for – especially for drier skin and for skin showing more advanced signs of ageing. 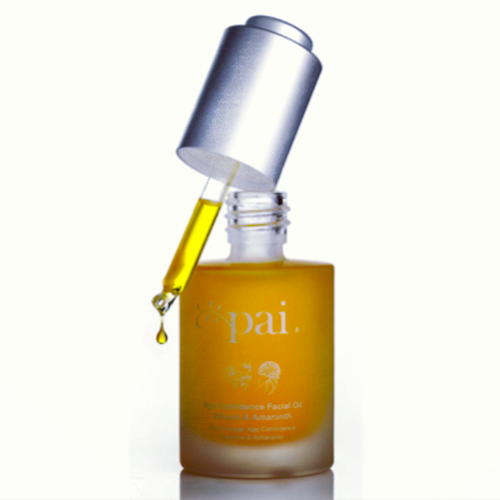 Pai are very careful not to call this oil an anti-ageing product – the Age Confidence label, I think, is a welcome one. There’s no silly “look ten years younger” message here; it’s all about being kind to the skin as it ages and making it the very best it can be. Well-moisturised, well-fed and with good defences against all of the aggressors that can age it.